Last year, we were smart and planted a ton of cabbage in the garden. I don’t know how I made so many pots of cabbage soup, but managed to miss the idea of making coleslaw with all of those perfect, round heads of cabbage! But I did! So this year, since space is premium and I wanted to try something different, I planted eggplant where I would have put the cabbage. 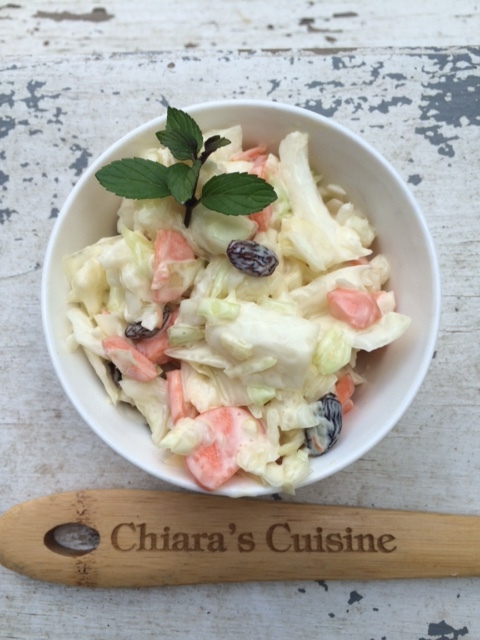 And then I had a wonderful reverie about some sweet, tangy, crunchy coleslaw. Darn! Should have grown it again this year. Literally, you place all of your above ingredients in a bowl, mix to incorporate well, and pop in the fridge. You can definitely eat this right away, but the flavors are amazing the longer you let it sit! Note: You can add a little more sugar and/or raisins if you prefer your slaw on the sweeter side. Just add bit by bit and taste as you go! My guess is this would serve 8-10. I, on the other hand, have no shame and could probably eat this as a main course in two or three meals. Don’t judge! It’s really that good! Thank you, Moose, for the bamboo utensils! And I don’t want to be dramatic and wonder out loud when the heck I will get to sit down to one of my lovely sewing machines and make something, but I guess I just kind of did! P.S. Happy Birthday to the wonderful Cancers in my life today! You know who you are! Next > Meet Our Peeps! We’re back to eating lots of cabbage as we have an awesome farm stand here in our little town. I picked a huge head up just today for $1 so will try your slaw recipe. I will leave the veggies in the salt & vinegar overnight to coax some of the juices from them before adding the mayo. We’re not growing cabbage but do have a nice patch of daikkon radish for future cabbage salads & such. Not much sewing going on around here either, after 5 days of rain I need to be outside! Let me know how you like the ‘slaw!